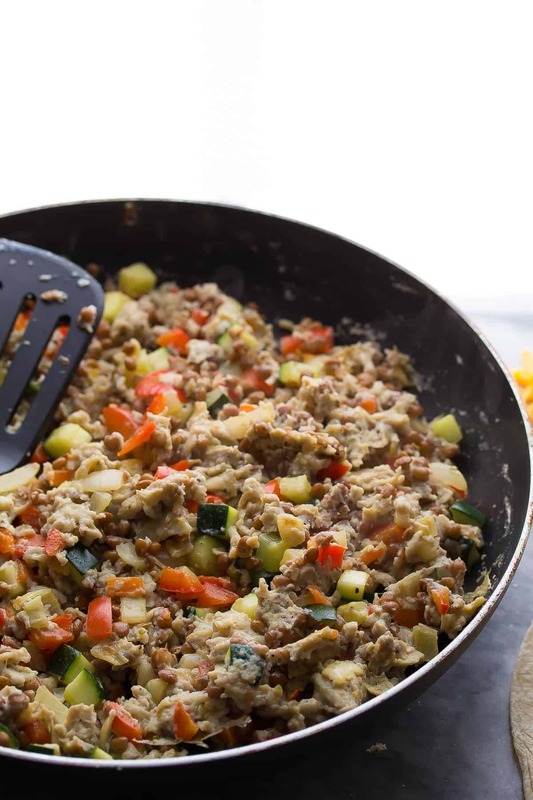 Freezer-friendly and healthy breakfast burritos get a boost of nutrition from lentils and zucchini! Make a big batch ahead of time, then thaw them as needed for breakfast. Are you a morning person? Anyone who has met me will tell you I. Am. Not. I would love to jump out of bed and get things done right away. Sadly, no matter how much sleep I get the night before, I cannot carry on a conversation before coffee. Just can’t. So this recipe is dedicated to all of the people like me: the morning zombies. 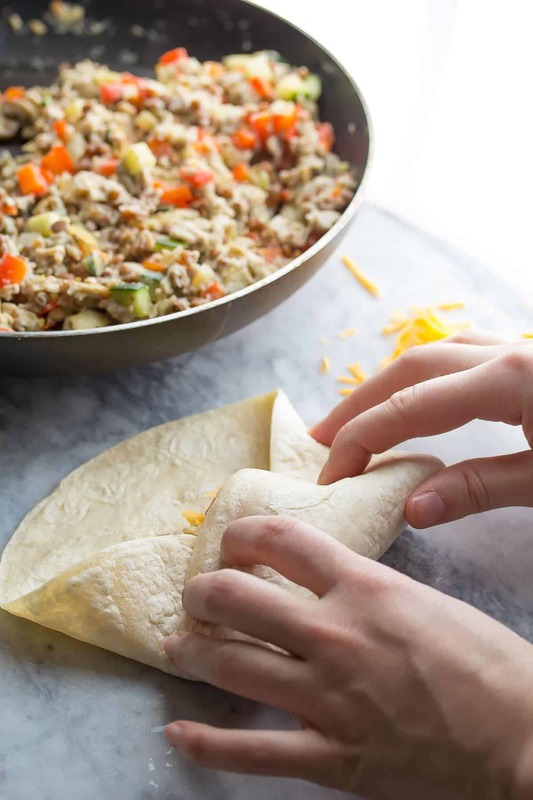 We can’t be depended on to cook up a batch of French toast for the family, but we might just be able to pull off thawing out some breakfast burritos. After the success with these Egg & Quinoa Breakfast Muffins and these Spinach, Feta & Red Pepper Breakfast Quesadillas, I thought it was time to make another freezer-friendly breakfast recipe. In addition to the lentils I really wanted to add some veggies, because I like to sneak veggies into all of my recipes (have you noticed?). 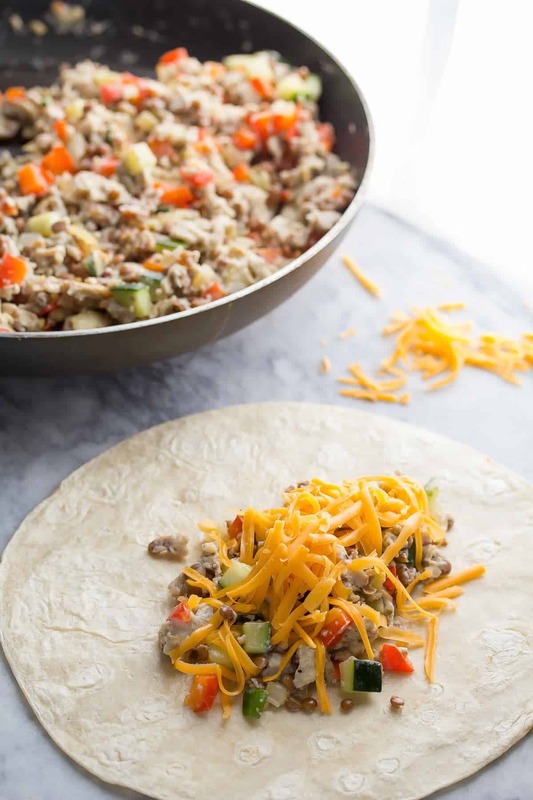 So I added some onion, red pepper and zucchini into these healthy breakfast burritos. Make ahead. Freezer-friendly. Little to no effort in the morning. They are FILLING! I could only eat half of one, and it kept me going right on through till lunch! Love that! They taste great! Cheese, eggs, lentils, some veggies. All wrapped up in a tortilla. So good. , which is absolutely perfect for heating these up in the morning. You’re going to want to flatten them slightly so that they warm right through. You can also use a fry-pan but it takes longer. Or, you could just heat them in the microwave on a paper towel. Any which way, they are not soggy. 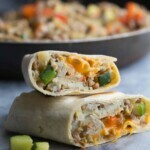 A healthy, freezer-friendly breakfast burrito recipe that you can make ahead of time and reheat quickly in the morning. Heat oil over medium heat. Add the onion to the pan and cook for 5 or so minutes until soft and translucent. Add the zucchini and bell pepper to the pan, and cook for 5 or so more minutes, until soft and cooked through. While veggies are cooking, beat the eggs with the salt, pepper, and oregano. Add the eggs and the lentils to the pan and cook for 3-4 more minutes, until eggs are cooked through. 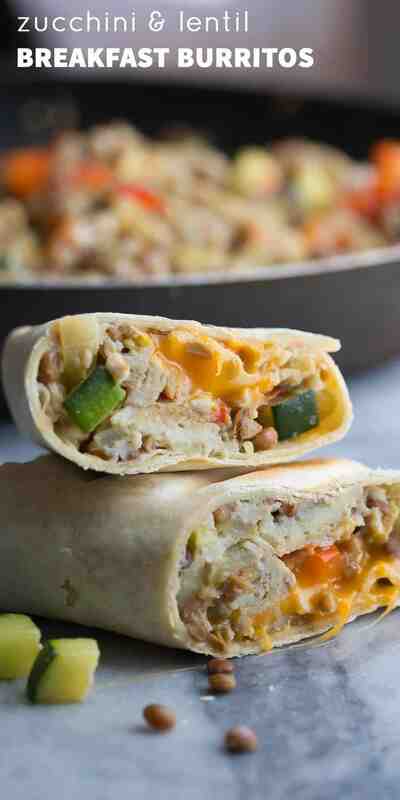 Spread out ½ cup of the *cooled* egg/veggie filling onto a 12-inch flour tortilla. Sprinkle with ⅓ cup of cheese. Roll up as shown in photos and wrap with plastic wrap until you're ready to serve! Wrap tightly in plastic wrap, then place in a large ziplock bag. If you are storing for longer than 1-2 weeks, you may wish to wrap with aluminum foil as well. You can either thaw in the fridge overnight, or microwave on a paper towel for 30 seconds/side. I recommend crisping them up on a George Foreman Grill or in a frying pan. Made this this morning with a couple of changes. I didn’t have canned lentils so I made some dry ones in my instant pot. These came out nice a creamy and I added them to the eggs just before cooking. I also did not wrap them up in tortillas but ate them as a veggie bowl. Super yummy!!!! Zucchini and lentils in a breakfast burrito? This intrigues me. And I can freeze them? Well that sounds perfect since I am having a baby and want to stock the freezer! But I have never heard of lentils in a can, are they sold near the beans in the store? OR I guess I could just cook some of the dry ones I have. How many ounces is the can? Thanks! Hi Jamie! I’m in Canada so I’m not sure if it’s different here then where you might live, but we can find canned brown lentils in the store, right near the beans, in 19 oz /540 mL portions. If you are going to cook them from scratch, I’d recommend green or brown lentils, not the red ones, as the red ones will probably end up really mushy and maybe too liquidy for these burritos. Congratulations! These will be perfect for a hungry new momma! You know I run out of time & I end up dashing out the door. Then i’m hungry mid morning and don’t make the best choices. So happy you liked them, Katherine! They are definitely filling, aren’t they? I’m a complete new comer to your blog, but last night I made these breakfast burritos and the thai turkey meal prep lettuce wraps. Let me just say…AMAZING. My boyfriend isn’t a picky eater, but he’s no fan of sneaking in veggies. He’s attempting to drop weight classes in strong man training and these ideas are absolutely perfect. They’re yummy with low calories and a decent chunk of protein. Keep the hits coming! 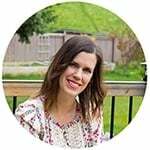 You’ve gained a follower for life, and I am telling everyone I can get to listen about this blog. Yay! Your comment has seriously made my day, Samantha 🙂 I’m so happy you enjoyed them! These were delicious! Although, i used maple baked beans, cheddar cheese, and hickory smoked center cut bacon. Easily the most enjoyable and amazing tasting breakfast food I’ve had. Not sure they’re the healthiest, but they’re a great middle of the road nutritional item to start the day 😀 thanks for a great recipe to use in my meal preps. I’m so glad you liked them Greg, and your modifications sound great! They are definitely a very filling breakfast, sometimes I find I’m not even hungry until lunch, and other times I only need half of a burrito for breakfast. Thanks so much for your comment! Hi! I just made a batch of these. I was surprised, very good flavor! I’ve never made a breakfast burrito that uses zucchini before, but it’s a great addition. I only have one question though, I added up the sodium content and got closer to a 850mg per burrito. Was your measurement not counting the flour tortilla? Hi Colin! I’m so glad you enjoyed the breakfast burritos. I use My Fitness Pal to calculate nutritional information, and as such it should really be taken as an estimate. I definitely included the tortillas, but sometimes ingredients are off for certain values. I can run it through again and see if the sodium content changes? If you’d like, but it’s not necessary. When I was shopping I chose the lowest sodium burrito wraps I could find. I ended up with some wheat flour wraps, but they counted in at almost 340mg sodium each. I manually added up the sodium content of everything and divided by 6, and that’s how I came to my estimate of 850mg. Anyways, I’m honestly impressed by how satisfying and filling these are! A normal eggs and sausage breakfast usually leaves me feeling hungry after only an hour or so, but these keep me going all the way until lunch. I’ll definitely be making these again. I’m so glad you like them, Collin! I find the lentils really give them extra staying power. For the sodium content, the calculator I use pulls from a database of ingredients. I bet sodium content varies between different wraps/brands. Looks great. I gather you need 6 12″ flour tortillas? YES! Sorry about that, Leslie, modifying the recipe. i haven’t had burritos for breakfast before but you have convinced me that i am missing out on something very delicious! I’m glad I’m not the only non-morning person! I was told I’d ‘grow out of it’ but that sure hasn’t been the case. Thanks, Kelly! This was heavenly! I added lime juice and fresh cilantro too right before eating. Fantastic! Thanks for sharing. I’m so glad you liked them, Rach! That lime and cilantro idea is genius. I will try adding them next time for sure! absolutely fantastic! Make ahead is the best part! 🙂 Great recipe Denise! I always have to sneak some veggies in, don’t I? 😉 THanks, Sarah!